White fillings are increasing in popularity as they restore function whilst keeping the natural appearance of the tooth. They come in an array of tooth coloured shades to perfectly match your existing tooth. White fillings (composite resins) are bonded to the tooth which supports the remaining structure and helps reduce the amount of tooth removed before filling. This bonding quality also means that chipped or fractured teeth can be built up using the composite material. Composite bonding uses the same material as that used in white fillings but in this case it is used to change the appearance of a chipped or discoloured tooth. It can also be used to close spaces between teeth, make the teeth look longer, or change the shape and colour of the teeth. The composite resin used in bonding can be shaped and polished to match the surrounding teeth. Your dentist will use a shade guide to select the most suitable colour of composite resin. Veneers are a thin layer of porcelain designed to fit over the front surface of a tooth to mask any imperfections that make you feel self-conscious. Veneers can provide an ideal solution to improve the appearance of chipped, discoloured, stained or crooked teeth and generally very little tooth preparation is needed. Veneers are very thin and are held in place by a special strong bond. Crowning is a method to rebuild teeth which have broken down or have been weakened by decay or a large filling. A crown is an artificial restoration that fits over the remaining tooth, making it stronger and giving it the shape and contour of a natural tooth. Our cosmetic crowns are made purely from ceramic. This is in contrast to other types of crowns such as the porcelain fused to metal variety and gold crowns. The defining feature of these cosmetic crowns is that they are made from a translucent tooth coloured material which is attractive to look at and blends in well with the rest of your teeth. These crowns also avoid the dark line that can appear at the gum margin with porcelain fused to metal crowns. Your dentist will discuss the different options of cosmetic crowns available to enable you to make an informed choice. Teeth Whitening is one of the easiest ways to enhance your looks. Unfortunately in everyday life the microscopic pores of your teeth are pigmented with substances such as red wine, coffee and tobacco. These, along with age related changes give your smile a stained and discoloured appearance. No matter how many times you brush your teeth they will continue to darken with time. Now with whitening procedures you can reverse this process, bringing back that younger, brighter, whiter smile. Professional dental tooth whitening removes the internal stains not just the external ones to achieve a brighter look without harming the original tooth structure in any way. Zoom In Surgery Whitening for Immediate Results! Langmans Dental Health Centres are very pleased to be able to offer in surgery whitening. The procedure is very simple. We cover your lips and gums, leaving only the teeth exposed, a special gel is then applied. This works in conjunction with the state-of-the-art Zoom power light system to penetrate the teeth, breaking up stains and any discoloration. The gel will be applied for 3 or 4 fifteen minute sessions for a total time of up to an hour. This allows us to closely monitor your colour. 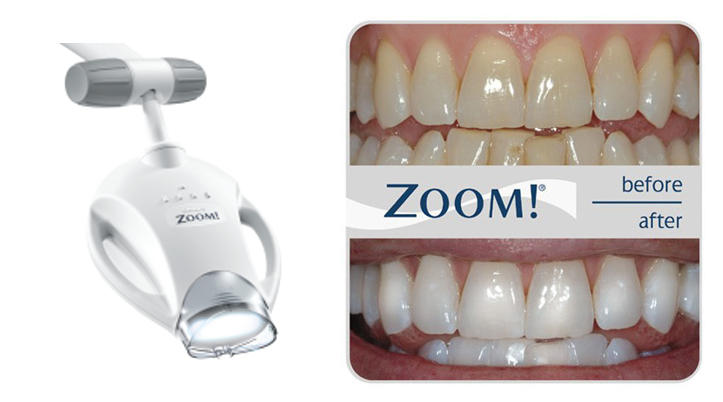 Zoom whitening can whiten teeth by up to several shades, brightening your teeth dramatically to its natural shade. Results are quick and very effective. We will also give you a pack of home whitening gel and custom whitening trays and for optimum results we recommend you continue with the bleaching for a few more days at home. Home Whitening is available for patients wanting to whiten their teeth at their leisure and preferring to do it at home rather than at the dental practice. Our Home Teeth Whitening system involves taking impressions of your teeth, from which a dental technician will create bleaching trays. A tooth whitening gel is provided and you will then be expected to wear the trays for two to four hours every day or overnight for between two to four weeks. The most common causes of tooth staining are due to the everyday things that we enjoy such as tea, coffee, red wine, nicotine etc. Airflow treatment is a pleasant and comfortable oral cleansing therapy that will leave your teeth feeling smooth, clean, polished and ready to smile with confidence. 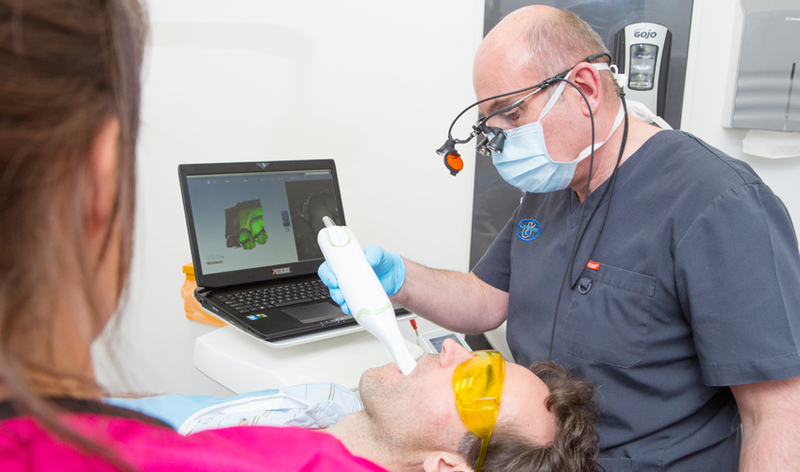 It involves projecting a jet of compressed air, water and fine sodium bicarbonate powder particles on to the surface of the tooth to polish the surface and remove debris. Plaque, soft deposits and surface stains disappear quickly and painlessly. Airflow is an excellent option prior to tooth whitening.